Women’s fellowship meets at Wesley at 7.30pm on the first and third Wednesdays of the month. A mixture of practical evenings, Bible study, quizzes and talks, with devotions, refreshments and occasional outings. Bright Hour meets at Wesley at 2.30pm on Thursdays for a mixture of religious, practical, social and fun activities, with devotions and refreshments. 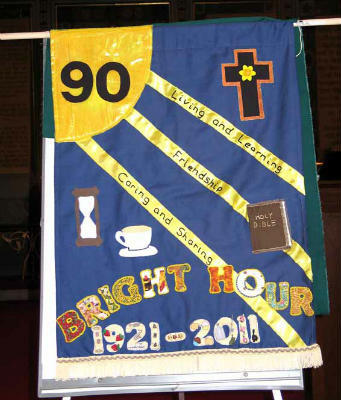 Below is a picture of the banner celebrating Bright Hour's 90th anniversary in 2011.